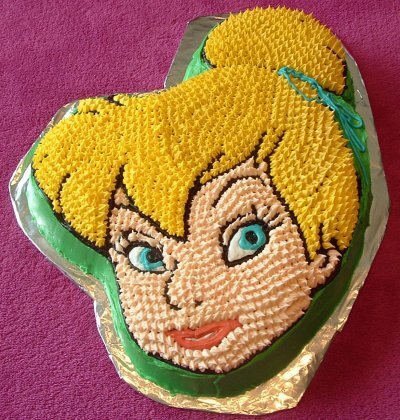 With all the hype surrounding the Tinkerbell movies I thought it would be fun to make a TinkerBell cake, not for a birthday, but for a fun movie night with my children. I decided to make the cake out of a yellow cake to help blend into the icing color. I used one of the shape pans to design the shape of Tinkerbell. Before adding the cake batter to the pan I sprayed the Tinkerbell cake pan really thoroughly. When cooking the cakes I usually pre-heat my oven to a little above the suggested cooking temperature. Then when I put the cake into the oven I turn the heat down to the suggested temperature. When the cake was finished cooking the cake separates from the pan a little. 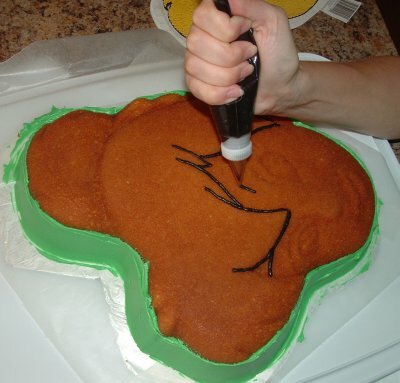 I also prick the cake with either a knife or a tooth pick. If it comes out clean then the cake if finished. I took out the cake, from the pan and let it cool. Make sure you levelled the cake. I needed a surface for the finished cake and this was my cleaver idea. I placed the empty cake pan onto an empty flat cardboard box. I then traced the cake pan. I cut out the shape and then covered it with tinfoil. When the cake was cooled I placed it onto the cut out shape ‘plate’ and it looked so professional. I used store bought icing that I tinted to make the right colors. I had purchased a kit that had the right Tinkerbell tint colors so that really helped. I used Azul Blue, Lemon Yellow, Red, Skin Tone, Kelly Green and Black. I decided to make the outside of Tinkerbell green because she is always dressed in green. For the top of the cake I used the decorating tips numbered 3, 16 and 21. We ate the cake with an ice-cream that was half chocolate and half vanilla and I also placed some cut up strawberries on the side, since they are in season right now. What a delicious movie idea! Making the cake to match the movie night was a hit and I’m sure I will do this again.